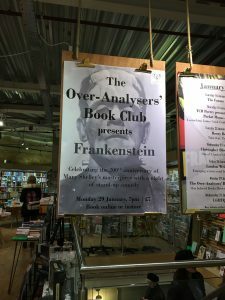 I joined an (all female) line-up of academics and comedians on Monday 29 January for the Over Analyser’s Book Club presents Frankenstein. 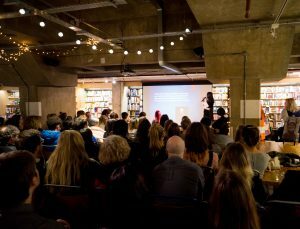 Playing to a sold out crowd in the basement bar of Waterston’s Tottenham Court Road, we heard about how Frankenstein is really about daddy issues, grant applications, the sorrows of completing a PhD, and fragile masculinity. 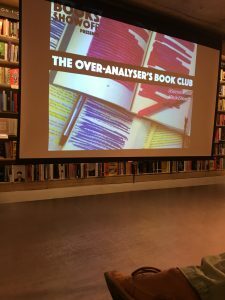 Coordinated by Steve Cross and Sarah Cox, the Over-Analyser’s Book Club is running events on a monthly basis in London, and will include future sessions on Lord of the Rings and Withering Heights! 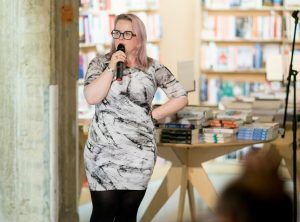 Audio of this event here! ← Fates of Frankenstein: Call for Papers!